Pardon the dust on the hydrangeas, but the "patio guys" cut a lot of pavers to create this work of art that I call "the new patio" and it kicked up quite a bit of dust. But now they are done and I have a new patio to enjoy. Remember the patio that was there before? It was a weedy mess almost from tthe day they installed it. This looks a little worse than normal because I had already started to dig out the flower bed that bordered the one corner of the patio and it looks pretty bad. 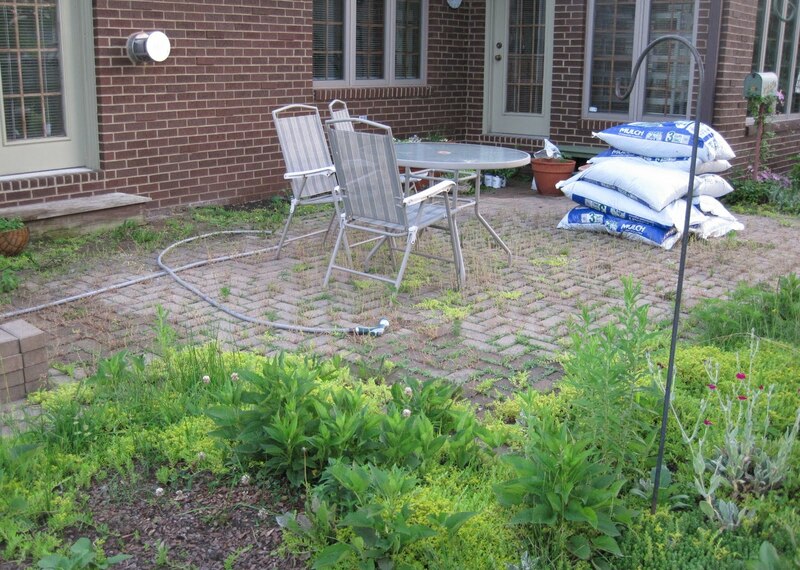 But the patio never looked great, always with weeds coming up in the cracks and wood steps by each door. 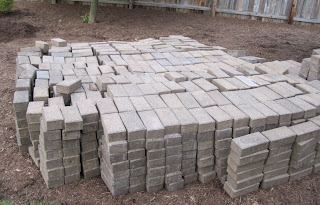 Plus some of the bricks had settled and it was becoming uneven. 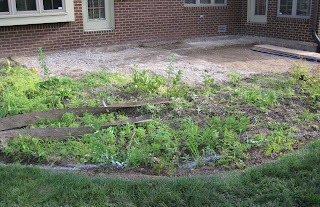 I was more than ready to replace the patio and the garden designer was more than happy to help me do so. 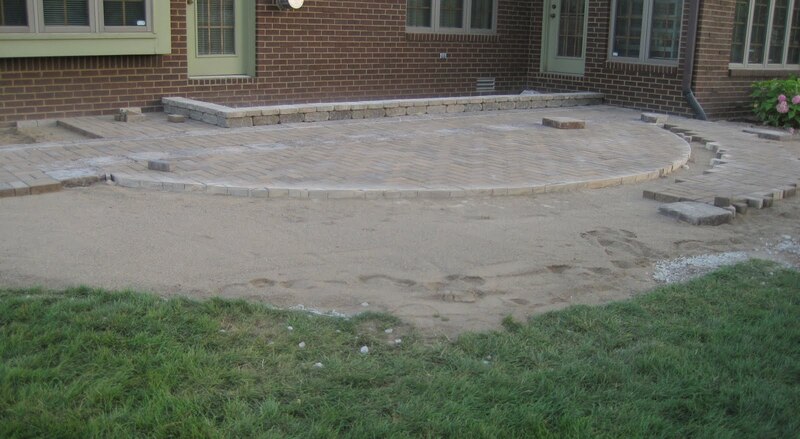 She came up with the basic shape and than hooked me up with a landscaper who did a detailed design and installed it. My nephews got the ball rolling on the new patio a few weeks ago by pulling out all the old pavers and stacking them neatly nearby. 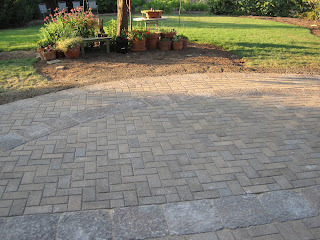 The patio guy incorporated those pavers into the design of the new patio. The original patio took about a day for a landscaping crew to install it. 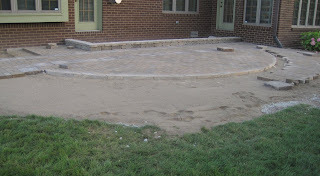 They dug out the area, added gravel, tamped that all down, threw on a layer of sand, set the pavers, added the wooden box steps, and left. Okay, maybe it took two days. The new patio took six days to install. I wasn't home during most of the construction but took a picture at the end of each day. I think they spent most of day 1 digging out all the old gravel and sand and dirt from where the old patio and surrounding lawn and flower beds were. They finished digging out the old patio junk and added a layer of coarse gravel and coated it with something so it is almost like concrete. 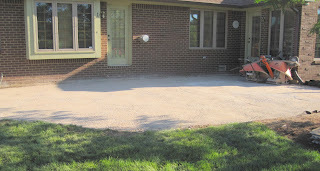 I think there are actually three layers of gravel like that plus a barrier fabric of some kind to keep the weeds out. By the third day, they were starting to lay out some of the pavers. More pavers were installed and some of the design is evident. They also started to install the lower step between the two doors. 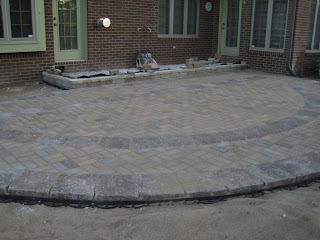 By the end of the 5th day, they had installed all of the pavers and made more progress on the steps by the doors. No more wood box steps. No more stepping down as soon as you walk out on to the patio. No more weeds in all the cracks. No little dips where pavers had settled. No "too small" crowded space. Just some rather dusty plants and a brand, new, larger, weed-free patio. The plan is to add a fountain and container plants along the house between the two steps. Something will also be planted beneath the boxed out window in that open space filled with good rich top soil. The garden designer hasn't really commented on what she thinks should go there, but all that new dirt says "Plant something here". I'm tempted to plant something there now. But I'll wait. 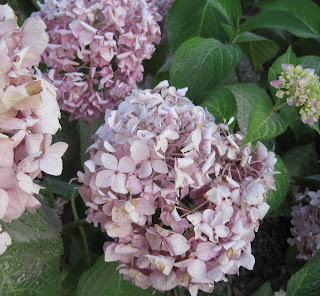 I'll sit on the stoop and gaze at the patio and out into the garden, imagining what I'll be planting around that tree. I think this is a much better patio than the one I had before! Excellent solution to the two doors! That brick wall between them is screaming for a climber! 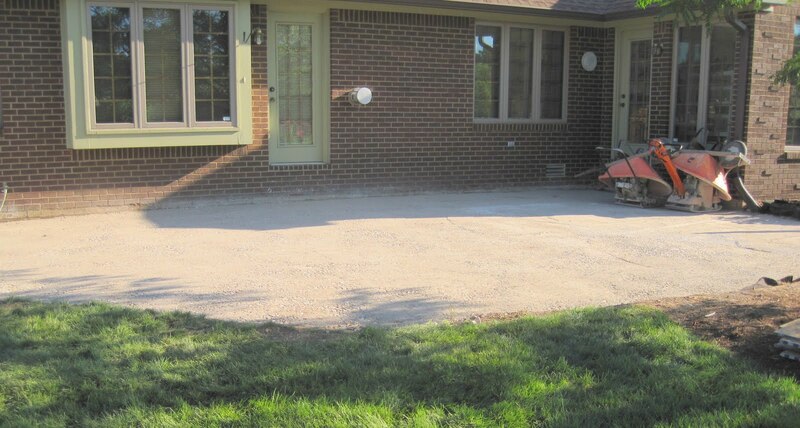 Enjoy your new patio. When you return from Buffalo you will have to have a christening party for the patio. It is beautiful. Maybe your minature garden can go up close to the house where you can see it, with a big beautiful climber towering above them. Love it, Carol. It seems to tie the whole house together with the raised area for the two doors. Can't wait to see the final results with the fountain and planters. That looks great! I hope it will be a pleasant relaxing area for you. I am sure you will make it shine with your gardening prowess. The patio looks fantastic. Can't wait to see the whole thing completed. 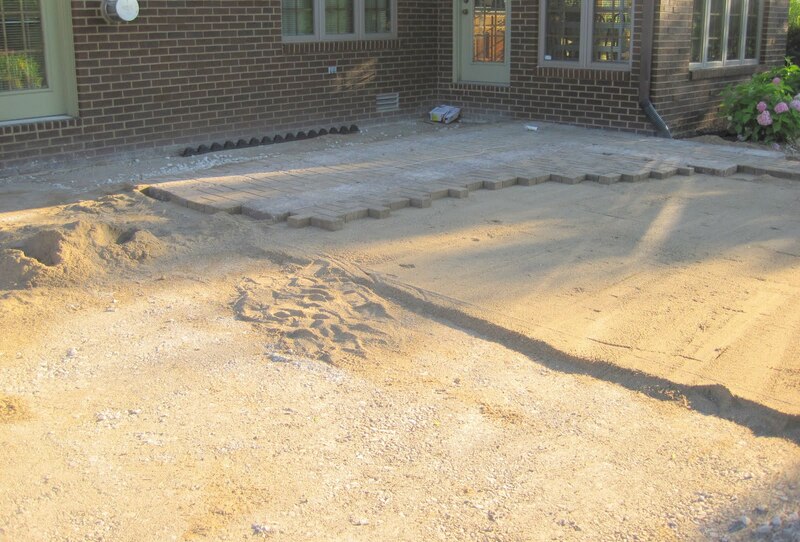 I love the design of your new patio! A fountain will look really nice too. Good for you! It looks amazing, love the curve and the two different stones. Now I want one too! Love, love the new patio. It looks great. I love the design in the pavers. Bet you're itching to get plants going. 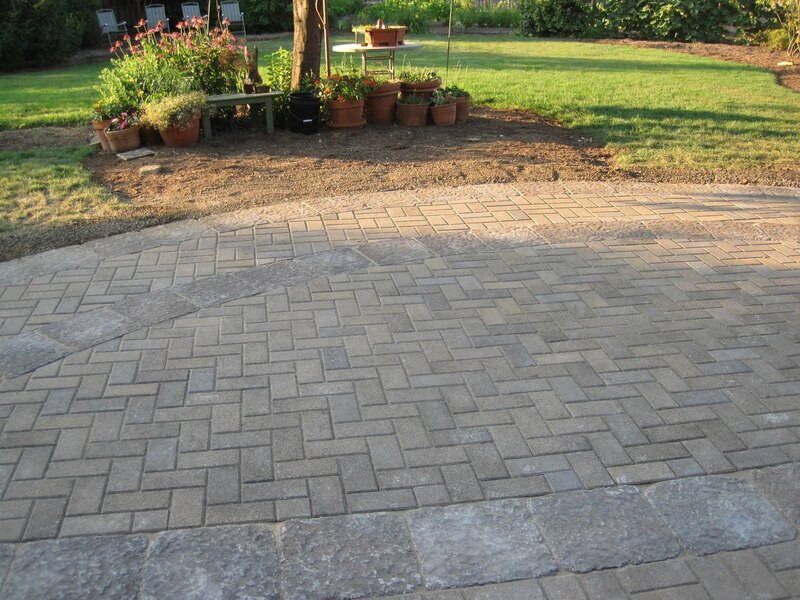 Have always liked patterned bricks - your new patio is a visual treat! It's gorgeous! What perfect timing to enjoy sitting out there & imagining the projects to come. Your new patio is absolutely gorgeous! You must be enjoying it so much. Before and after pictures of projects are the best. Thanks so much for sharing! You are so right This is a much superior patio to your old one. In fact, I would go so far as to say it is absolutely beautiful. I really like the solution of the step down from the two doors, too, especially since it will give you a platform for a fountain. And I am looking forward to what will be planted in the space below the window. You must be so happy that you were able to engage a garden designer! It looks like you really hit it off with a good one, too. I love the patio! It is perfect. It is beautiful. And I love the tie-in between the two doors. What a difference. I think I'd sit there all the time.